Of course we are all afraid … of something. But if we really had to unwrap it, and describe to another what we were really TRULY afraid of … I wonder what you would share? Afraid of what I won’t accomplish – afraid of what I will. Afraid of my weakness, afraid of my power. Afraid of my darkness. Afraid of my light. Afraid of the decisions I make, and the one’s I don’t. Afraid of the actions I take – and the ones I won’t. Afraid of all I run from … and to. Afraid of the choices I have, and the ones I don’t. Afraid of all that I am … and all that I am – not. What I have learned, my beautiful W3, is this … Fear stops us in our tracks. It makes us inventors of stories, and creators of reasons – not to take a next step. And I KNOW you want to take that next step. So here is a first next step I am inviting you to take. 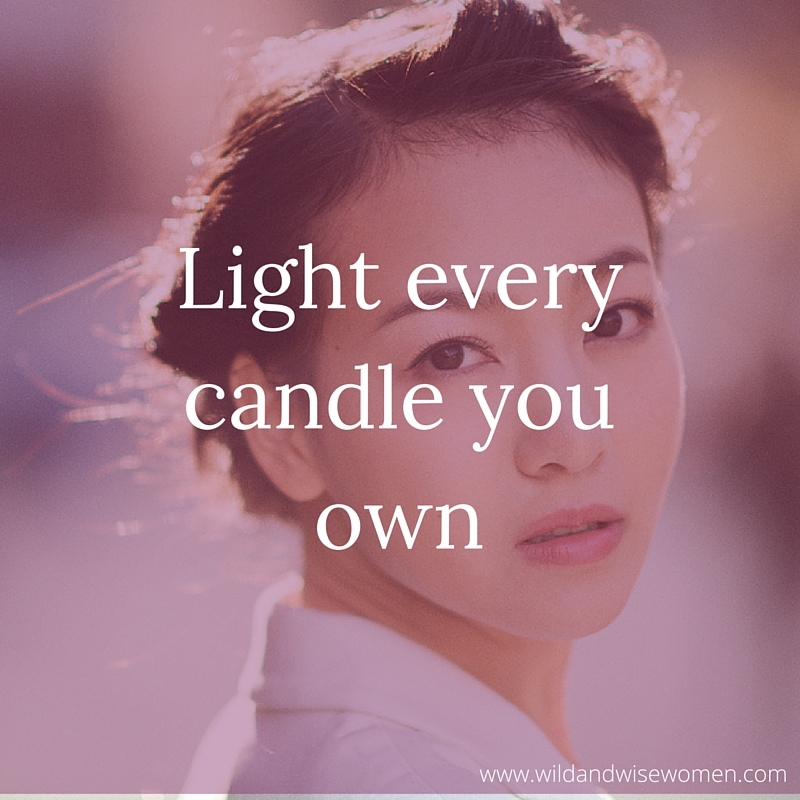 Light every candle you own. If you don’t own any – or many – go to your nearest supplier to gather a few – for you will need them for this exercise. This is the first step W3. Just look at that fear that is holding you back. Identify it. Bring it into the light and then … check that sucker off the list with an action step or two to have it disappear from your life forever (or at least wrangle it into manageable submission)!! Ah … did you think I was going to end with just the ritual of lighting the candle and speaking to the fear? Ha! We BOTH know that won’t get the job done. But it’s an important and symbolic part of the process. Think I’m exaggerating? Lovely – make no mistake. We all have fears. The most highly publicized among us will admit to vomiting EVERY TIME before they take the stage to sing to thousands of adoring fans, and have shared the rituals that have allowed them to take their next steps – to stop from feeling small INSIDE, when the world only sees how big their lives seem to be. Feeling small? Light a candle. Identify the fear that is contributing to that feeling. Now – what are two action steps you can take – baby steps (you all know how I love baby steps) – that will move you forward and that will minimize or eliminate the fear? Feeling afraid, uneasy, unsettled, or upset? Light a candle. Identify the source that is contributing to the unrest and decide on the two baby steps you will take to ease the pain. Bring light to YOUR situation. Shed light on the stories and the reasons YOU haven’t moved forward in the ways you most desire to. Light a candle W3. And heck, while you’re at it – go all out. Relax, in a full bathtub, with a glass of wine or cup of tea, soft music. Enjoy the candles as the light dances all around you, as the light reflects on the water – reflect on what your future is going to look like, and feel like, as you make peace and find ease with your fears. And breathe W3 – always we breathe. We are strong as we are one, we are brave together. Light every candle and I hope you’ll share in the group the candles you lit, the fears you identified, and the action steps you are taking.